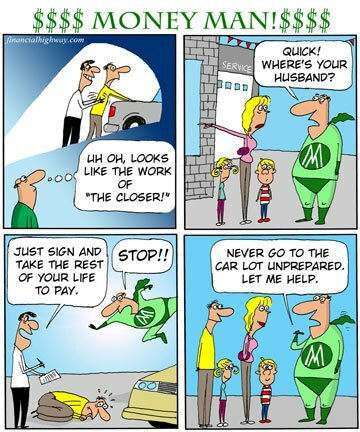 financial help from a different type of professional or hero, thus the creation of “Money Man”. Money Man is designed to bring a blue collar approach to money management, or perhaps more accurately, financial survival. He will help various families through issues faced by people trying to get by in these tough economic times. One minefield families have to face on occasion is buying a car. In the initial installment of Money Man, Money Man will come to the rescue of a family that is car shopping. This can be a traumatic experience as the family will face such budgetary enemies as “The Closer”, “The Finance Guy” and “The Switcher”. Hopefully you’ll enjoy Money Man as he helps the Walton family. As the Waltons’ will discover the pressure exerted at a car dealership can be nearly that exerted at “Time Share Mountain”.